Crystal chandeliers can make an instant impression on your guests. If chosen well, they can fit in well and suit the décor of your home, but without care and attention they can look out of place. If you think a crystal chandelier would look good in your home, consider some of these options. At amazingchandeliers.co.uk they have a Montego Gold 9 Light Crystal Ceiling Light that combines gold and crystal. It isn’t an overpowering chandelier so it could look good in more modest homes. It is available for £177 with shipping costing around £7 for mainland UK. Debenhams have quite a large selection of chandeliers, including classic and contemporary styles. They have the Litecraft Polished Chrome Emily 6 Light Crystal Prism Chandelier for £217 with free delivery. It is quite a contemporary design and again not too grand in size or style. The Crystal Chandelier Company has a good range of crysal chandeliers ranging in price from around £200 up to around £3,600. They come in a variety of shapes and sizes so finding one that suits you should be easy. They offer the CCB7150-20 Basket Style Empire Chandelier for £3,400. It looks incredible but due to its grandeur and size it will probably only suit large rooms or hallways with high ceilings. 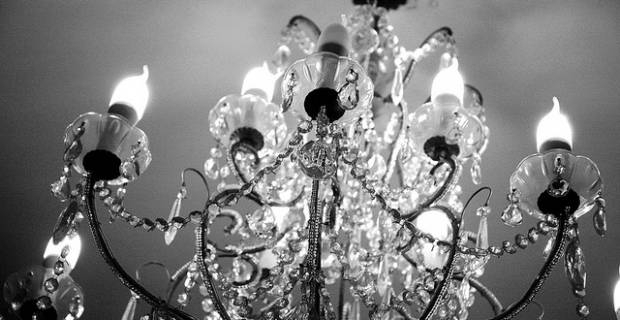 The Chandelier and Mirror Company have a great selection of crystal chandeliers. They offer the Nanako for £517. Its contemporary design and square shape makes it eye-catching and unique, and it could suit almost any room. Check out chandeliersandmirrors.co.uk to browse their selections. Crystal chandeliers can make any room a little special. There is a huge range available in both price and design, but be careful before commiting to buy one because it can be notoriously difficult to get one that blends with your decor. Also be prepared to invest time into cleaning it regularly! That said, a well chosen chandelier is well worth the effort.